A firefighter works from the top of a ladder while working to put out a fire at Patron Mexican Grill located at 3720 Taft Highway on Monday, March 18, 2019 in Signal Mountain, Tenn. Fires across the Chattanooga area over the weekend destroyed two structures and a business and damaged another home. The most recent happened early Monday morning at Patron Mexican Grill on Taft Highway. The fire was reported about 6:30 a.m. by a passing motorist who saw heavy smoke coming from the restaurant, according to a statement issued by Hamilton County Emergency Services. › Whenever possible, use flashlights or flameless candles. › Keep candles at least one foot away from anything that will burn. › Blow out all candles when you leave the room or go to bed. › Avoid the use of candles in the bedroom and other areas where people may fall asleep. › Never leave a child alone in a room with a burning candle. › Keep matches and lighters up high and out of children’s reach. When Walden's Ridge Emergency Services arrived, there was fire coming through the roof. More companies from Signal Mountain, Red Bank, Chattanooga, Dallas Bay and Hamilton County Marine and Rescue responded. At one point, authorities were forced to close two roads as fire companies worked to put out the blaze. No injuries were reported, officials said, but Hamilton County EMS was on-site for any potential injuries to firefighters. The cause of the fire is under investigation by the Hamilton County Fire Investigation Task Force, officials said. But because the building's floors were wooden, it will likely be at least five days before investigators can even get into the building to begin investigating, said Amy Maxwell, spokeswoman for Hamilton County Emergency Services. And a cause may not be determinable because of the destruction of the building. In the meantime, fire officials have asked the public to stay away from the area. Monday morning's incident came after three other fires broke out Sunday. At around 5 p.m., a garage off Old Dayton Pike in Sale Creek was destroyed. The garage was detached, so there was no damage to the home, and no injuries were reported. Maxwell said the cause hasn't been determined but it likely will be ruled accidental. › Install smoke alarms on every level of your home. Test them monthly to make sure they work. Change the batteries every 6 months. › Create an escape plan for your family and practice it, especially if you have small children. The plan should include a designated meeting place. It’s very important to practice fire safety with kids, so be sure to familiarize your children with the sounds of the alarm(s). › Keep grills, cookers and fryers at least 3 feet away from your house and shrubs or bushes. › Keep space heaters at least 3 feet away from anything flammable. Always turn off heaters when leaving the room or going to bed. › Have your chimneys, fireplaces, wood stoves and central furnace serviced once a year. › If someone in your home is deaf or hard of hearing, consider installing an alarm that combines flashing lights, vibration and sound. Then at around 8:15 p.m., a Walden's Ridge home in the 500 block of Grayson Way, just across the Sequatchie County line, was destroyed by fire. There were no injuries. 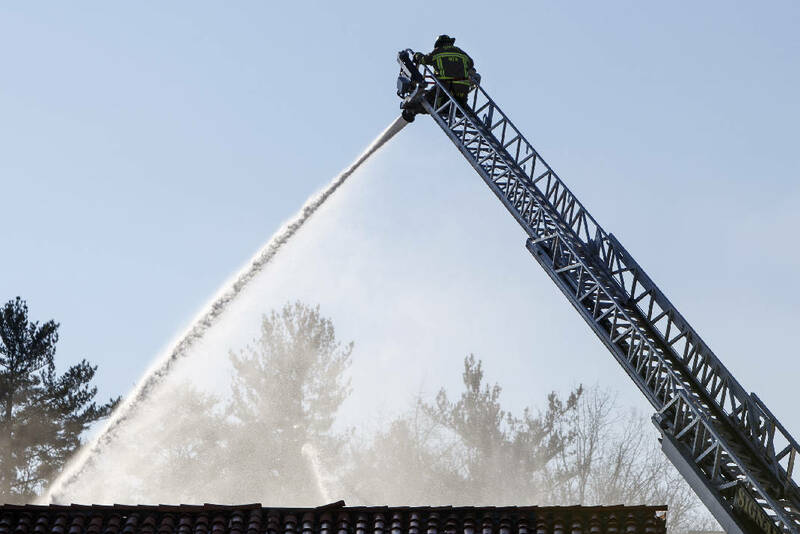 Firefighters with the Lone Oak Volunteer Fire Department responded to the scene and found flames coming through the roof, and more firefighters from Walden's Ridge Emergency Services responded to assist, officials said. The cause of that fire is under investigation by the Sequatchie County Sheriff's Office. Lastly, a candle is being blamed for a fire that broke out at around 10:30 p.m. in the 4200 block of Tee Pee Drive. The home was damaged but the fire, which has been ruled accidental, was extinguished in about 25 minutes. Several fire companies responded to that scene, as well, according to a statement by Chattanooga Fire Department spokesman Bruce Garner. Battalion Chief Nate Middlebrooks said the fire appeared to have started in the living room of the home. The resident told firefighters that he left a candle burning unattended in that room. The man said he tried several times to extinguish the fire himself before giving up and calling 911. Knowing when to call 911 depends on a number of factors, Garner said. "Basically, if you can't put the fire out yourself within a few seconds, then get out and call 911 immediately," he said. "The faster our firefighters get to your fire, the faster they can put it out and limit the damage."